It may be that I’m not meant to draw flowers, but I love them enough to be persistent. This first one was done with Tombow markers, which I find work well if you want to keep your painting loose. 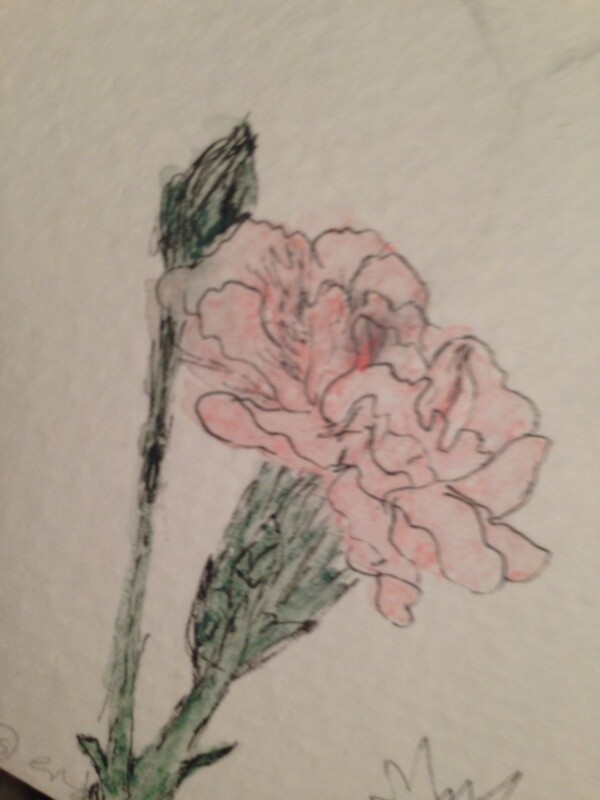 This one was sketched with Derwent watercolor pencils and liquified, as was this next, which I sketched quickly over top of a pencil drawing, thinking I could get rid of that pencil smudge….which was not to be. Oh well. Onward. Of all of the flowers, I like this one the best. Smudge or no smudge. I’m determined to be happy with my floral creations by the end of summer. You know, like a hundred drawings or paintings later. Hopefully this isn’t too unrealistic of a goal! We shall see. Spring is opening up all of my pores and I can’t wait to get into the woods and breathe the trees in. Is anyone with me? The moss and damp grass and old leaves and twittering birds and … space to think and be. If work wasn’t so crazy, I’d have stolen half a dozen chances by now. Maybe by Sunday, I’ll have a chance to hit the trail. With sketchbook in tow! I can only hope. Gotta enjoy these gorgeous spring days while we have them. Carpe diem! Not a moment to waste! Happy Friday! If I could draw from my imagination, I’d be *inserting image of dancing birdie tail feathers here*. Have a great weekend, everybody! Ciao for now. YAY! It is flowers! I love the middle pansy! And yep – I am with you – can’t wait to breathe in the woods! Needs to quit pouring down buckets of rain here first though! Hey – If April Showers Bring May Flowers, what do May Flowers bring? Pilgrims of course! 🙂 LOL! and sorry about all that food and heat “crap!” 😦 BOO! Thanks, my sweet. Same goes back to you! Love this post, Laura!!! It´s so full of positive energy, I was smiling the whole way through reading it! Your plan with drawing flowers is realistic, I think, they look already quite nice! I also like the last one best – it´s always that the one with the least efforts or done the most quickly gets the best, isn´t it?! It´s really cute, light pink and green go together so well!!! Thanks, Ann. I’m not at all happy with them, except as you say, maybe the pink one. I agree, fast is best. Otherwise there is way too much fuss. Do you have an easy time with flowers? Thanks so much, Ann! Sounds like great advice. It definitely helps when I draw faces, but I think in my mind there’s so much pressure to make the drawing as beautiful as the flower that I get stuck in it. Thanks for the help. I really appreciate it. Thanks! We shall keep flinging paint to paper! :)) Your work is v beautiful. If I could do stuff like that, I’d forget all about watercolor. Thanks, Jill! That does sound like an interesting way to tackle the subjects. Gee, I hope I remember these great tips later lol. Thanks as always for your encouragement and help. Thanks so much! Yeah, that makes great sense. I’ll have to try it. Thanks for taking the time to help me out! I really appreciate it. Boy, you sound just like me. I’ll have to try this. 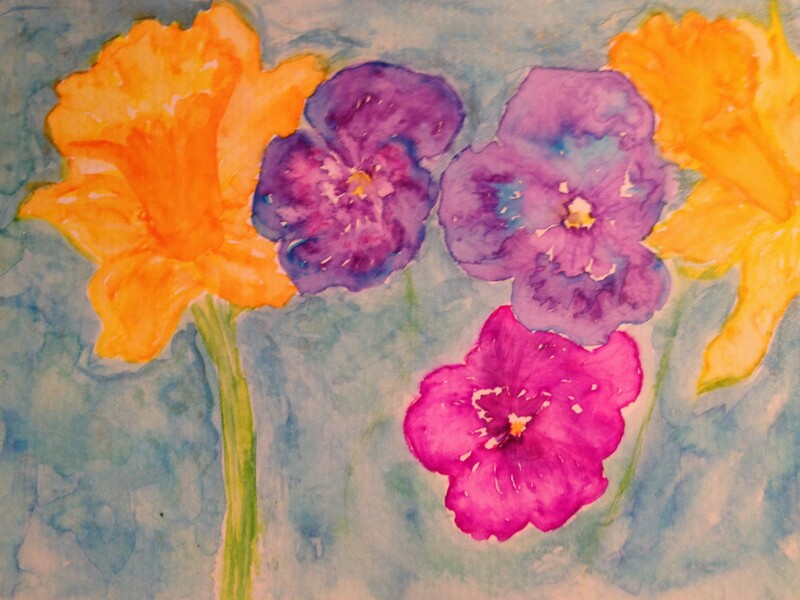 Do you go to google images and search for flower sketches? I’ve never searched for sketches or drawings, I’m only after photos. People I follow here do beautiful work, but they’re mostly botanical artists and their drawings are as detailed as the flowers! Argh lol. I so admire them though. You could for sure use google images. I found a book of flower sketches at a local book store. They were small pictures grouped together on the page. I would find one I liked and copy it and then enlarge it and use the enlarged image to draw from. I haven’t done this in a long time but I got the idea from a watercolor class that I took. The instructor did the same thing but to save time she had us trace the image onto our watercolor paper first before painting. The book I found was a botanical clip art book. I have seen some beautiful pictures too and I know what you mean by the Argh! I’m not fond of drawing flowers but I love them. 🙂 Good for you for persevering! It’s such a nice way to show off the colors of the Tombows especially. Thanks. I’ll keep trying. What better way to express beauty? Although almost anything in the natural world does that, I guess. 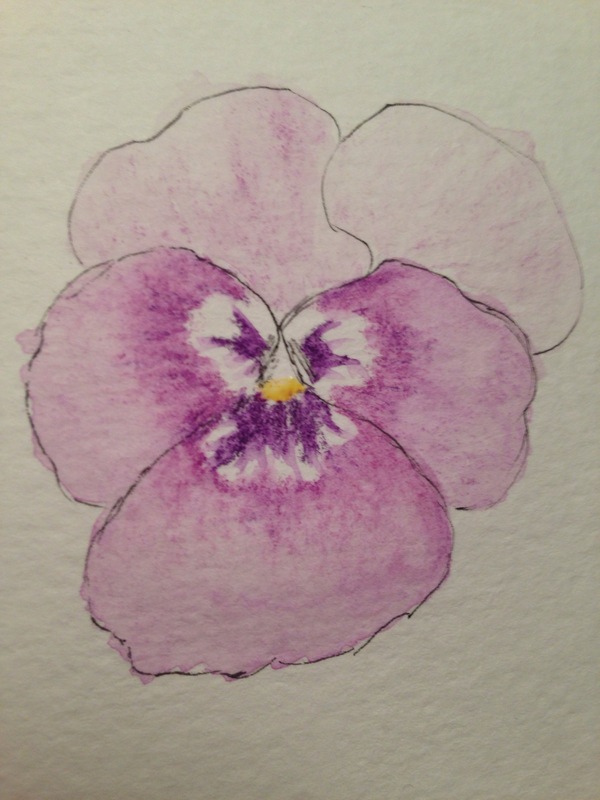 I really love the pansy. I think you are doing fine with your flowers. Very pretty 🙂 Thanks for posting!